Our Zapier integration is currently in Beta testing for Veeqo users. This guide shows you how to quickly start integrating Veeqo with the many other applications Zapier supports. As a first step we recommend taking a look at Zapier's Getting Started guide which shows you what Zapier is, and how it works. Taken a read? Now you can jump right in! What can I do with Veeqo on Zapier? To get started Sign Up for a free Zapier account. You'll be asked to choose a few Apps you already use in order for Zapier to help make recommendations for you. In order to get access to Veeqo, you need to accept the invitation for the application here. Upon selecting the application you will be prompted to select a trigger. A trigger is something that happens in Veeqo that you want to pass through Zapier and into another application of your choosing. For this example we will choose the New Customer Created trigger which fires an event when a new customer is created in Veeqo, so select this and click Save + Continue. 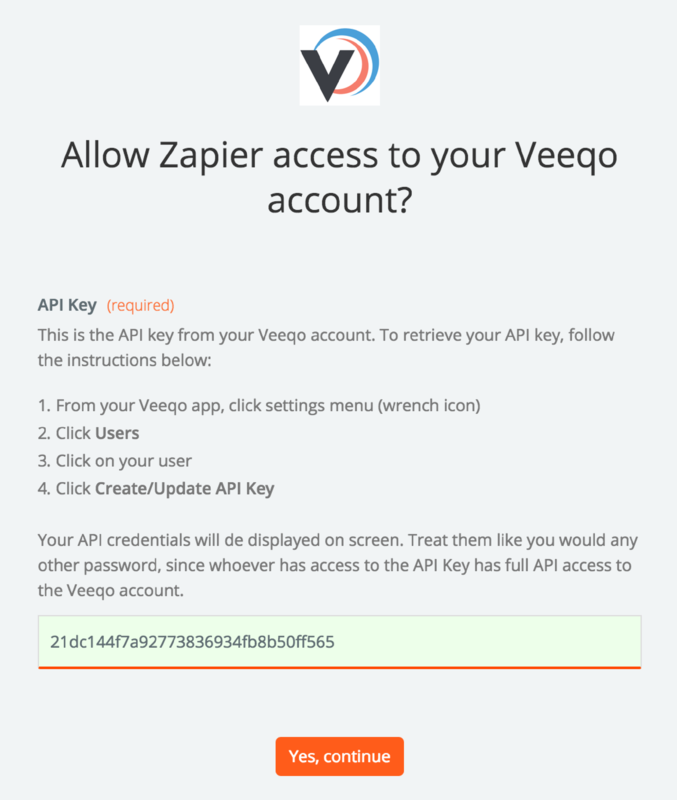 If you already have Veeqo accounts on Zapier (unlikely) then you'll be asked to choose an account. Otherwise you can click Connect a New Account which opens a new popup to ask for your Veeqo API key - with some instructions on how to get it. To get your API key you should go to your Users, click your user and click "Create/Refresh" below the API key. From that step we will try to authenticate you using your key. If you followed the instructions and have the correct key, then you'll advance to the next step. Otherwise you should re-check the key to make sure it looks like the one on the screenshot and try again. To make sure everything is well with the trigger and account you set up previously, Zapier will ask you to test this step to make sure it's running smoothly. Before proceeding with this step, make sure you have an existing record in Veeqo depending on what you're triggering so Zapier can fetch this. In this case we need to create a Customer in Veeqo for it to test our New Customer Created trigger. If you have done this then the request should be successful so you'll be notified of this, and you'll be able to click to view the data it received. Successful? Click Continue to start creating your Action zap. Your Action Zap is something that you want another application to do as a result of the trigger from Veeqo. 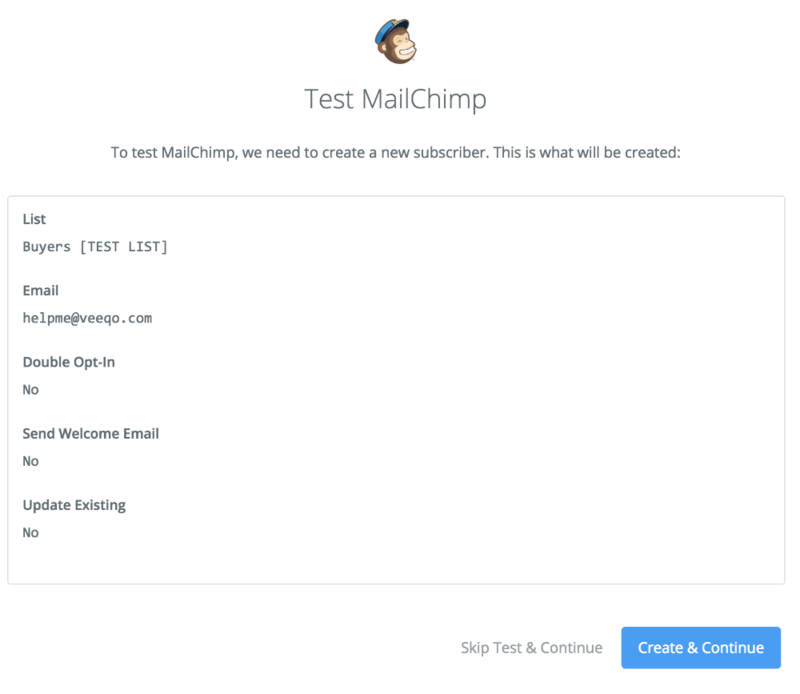 In this case, as we have a Customer created in Veeqo then we may want to create them as a new Subscriber to our list in MailChimp. If you have another application then you should select these in the list. It's also important to note that Veeqo supports Action zaps, so you could create a product or customer in Veeqo as a result of a trigger from another application. We should select the Add/Update Subscriber action. When this is triggered, it will add a new subscriber to a list of your choosing in a later step. This step can differ depending on the type of authentication that the application you're trying to connect with supports. 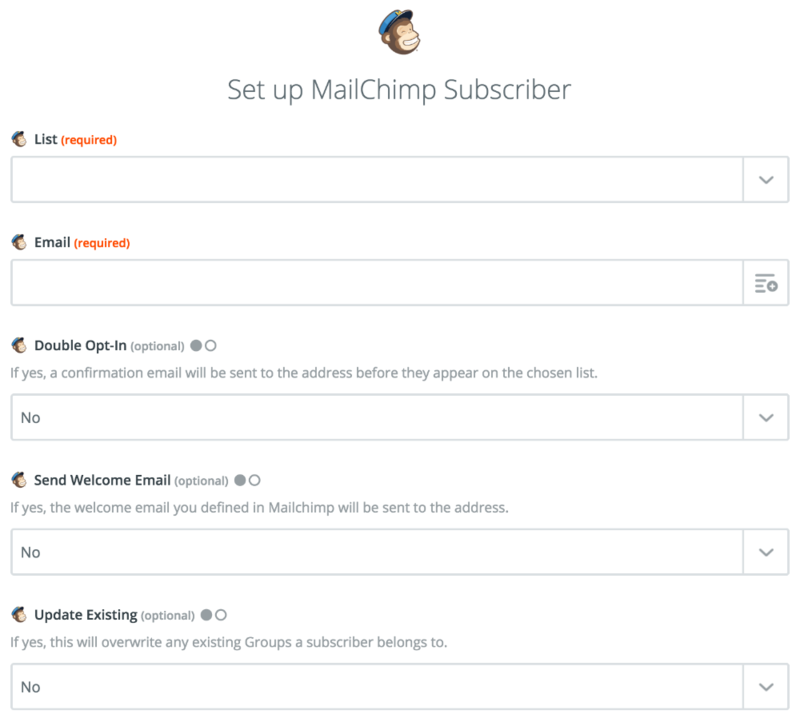 We'll be using MailChimp as an example, but for authenticating with another application we would advise taking a look at the Zapier documentation they have available. To authenticate your MailChimp account, Zapier requires your MailChimp username and password in order to connect. Enter this information and click Login, and Zapier will attempt to authenticate you. If all goes well then the account is added to Zapier so you can select this and click Save + Continue. In this case we have two required fields which are: List, Email. List - clicking the arrow to the right of this returns the lists on your MailChimp account so you can select from these. For example, we've added them to our "Buyers" list! To map the data pulled from Veeqo to this field, simply click the information you want. 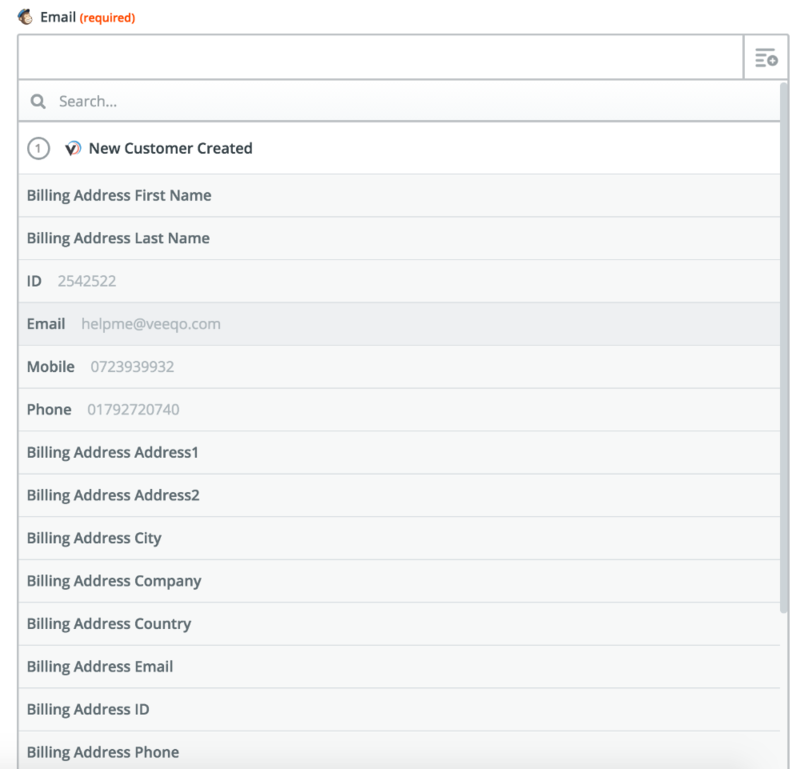 For example to send the customer's email from Veeqo, we need to click the Email field. After you do this you will see a node appear in the field. You can also add additional text to the field. You should do this for every text field that you wish to fill in the form. When you have mapped all of the data, click Continue at the bottom and you'll proceed to testing your Zap. This will contain the information you've mapped to the form with what has pulled in the Trigger test from Veeqo, as well as any additional data you've added. If it looks fine to you, give it a try by clicking Create & Continue. This attempts the process so you should see the latest record in the application you chose if everything is successful - Zapier will notify you of this. In this case, we should see our Customer from Veeqo now appearing in our MailChimp list. Did everything go well? Now you can click Finish to name your Zap which describes what it does and enable it. Have a further look at the triggers and actions Veeqo offers and set up more zaps so you can integrate Veeqo with the many other platforms Zapier supports! 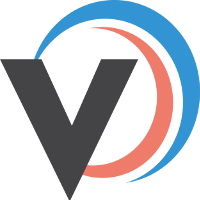 Have feedback/reports about Veeqo on Zapier, or want ideas for your next Z? Drop us an email at helpme@veeqo.com.